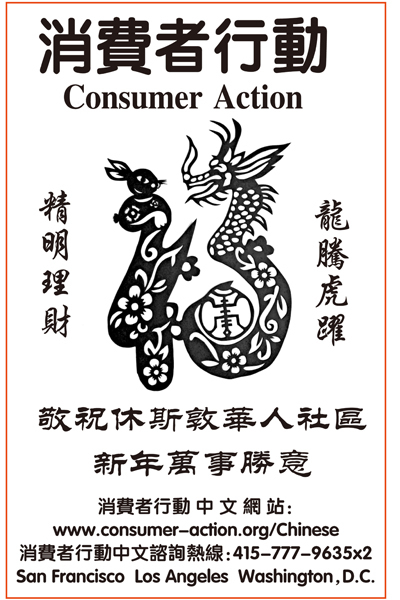 Consumer Action 2012 Lunar New Year Ad in the Chinese Times of Houston. Consumer Action conducted a MoneyWi$e training in Houston last year, and has established a strong relationship with the Chinese community there. Consumer Action wishes everyone a prosperous Lunar New Year! We have placed the following New Year’s advertisement in the Chinese Times of Houston to show our support for the local Chinese-American community. Consumer Action has a multilingual and multicultural staff that works with community groups, conducts national train-the-trainer events, provides presentations at local community events, and provides commentary to English, Chinese and Spanish media. Consumer Action also offers a complaint hotline; messages can be left for our hotline staff at (415) 777-9635, 24 hours a day.